Given the importance of BSNL as India’s national telecom operator we had taken to writing about BSNL. Others don’t get us wrong when we brand BSNL as India’s national telecom operator – they are owned by Govt. of India and still offer unmatched services throughout India. In the recent months we made few stories on BSNL where the opinions we expressed were widely hailed by our readers, many of them BSNL users. 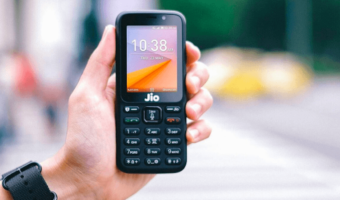 In one of our stories, we had analyzed BSNL’s drawbacks and suggested how they can improve, particularly in supporting customers. 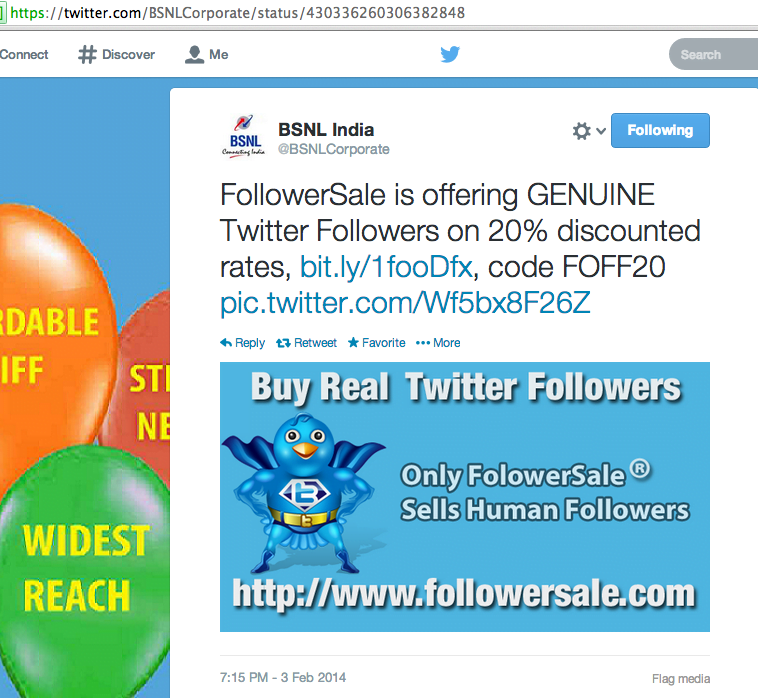 Since then BSNL has taken to twitter and facebook to publicize their offerings and provide support. BSNL has been on twitter since long. However in the recent past many new identities have popped up. While the new identities are set up attractively in a modern way (read background pictures etc. ), the interaction they generate is really poor. BSNL probably mandated all circle’s to log on to twitter but many handles have gone dead after a brief period of activity. It’s due to this very reason that we had been emphasizing about having a single national level handle for a company of BSNL’s size. 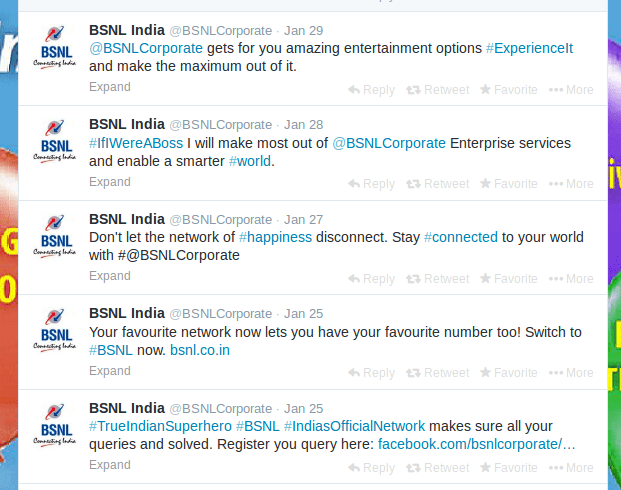 Let’s now delve deeper and analyze few twitter handles from BSNL. 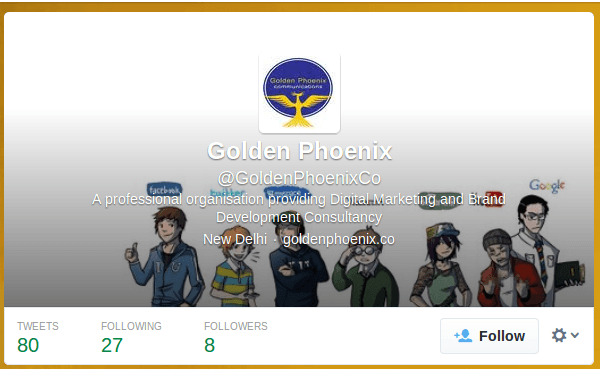 @BSNLCorporate: This account is managed by a small Digital Media Consulting company, Golden Phoenix which came into existence in 2010. Though the twitter bio says @BSNLCorporate is the official page of BSNL there is no mention of this handle in BSNL’s Corporate website. A consulting company must advise a client to do this first. How do you expect customers to find the twitter handle or verify its veracity if it is not even mentioned in official website? Till last week one or two tweets used to come out from @BSNLCorporate every day. It increased last week just due to a contest organized which we would term as a desperate bid to earn some followers. @BSNLCorporate even seems to have made a vain bid to buy followers, a rampant malpractice on social media where follower count matters. The tweet has since been deleted! Poor hashtag usage: Hashtags on social media are used to keep track of things in a better way. @BSNLCorporate used to come up with new hashtag everyday. Why not have a consistent hashtag – at least #BSNL. 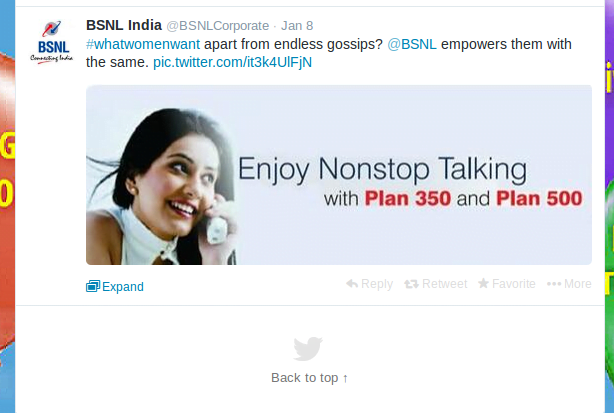 A search on twitter with #BSNL any time brings complaints from harrowed customers. 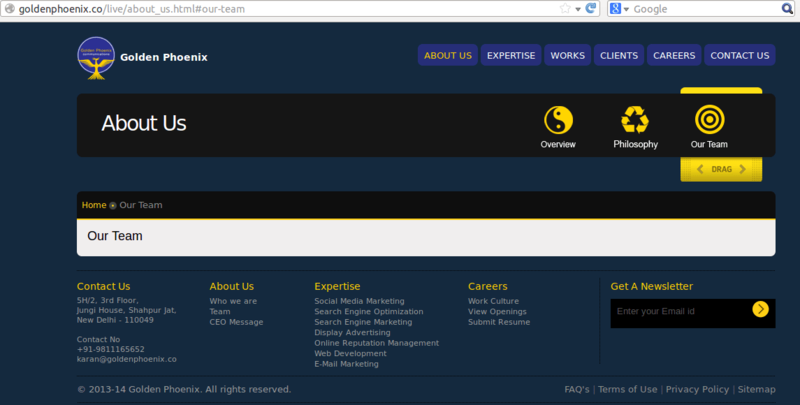 They showcase just over 40 clients in their website and BSNL is by far their biggest client. Golden Phoenix themselves don’t tweet. Their twitter handle contains automatic posts from their facebook wall (notice fb.me URLs) and have barely 8 followers. This is @BSNLCorporate’s first tweet. Would women like to comment on this? Other prominent twitter handles are @bsnlmobileindia, @BSNLLive3G (both linked on BSNL Corporate website’s homepage), @bsnl_karnataka and @BSNLKERALA. As per the information we have, BSNL circle social media presence is handled by designated BSNL employees and not by Golden Phoenix. They are doing a better job! 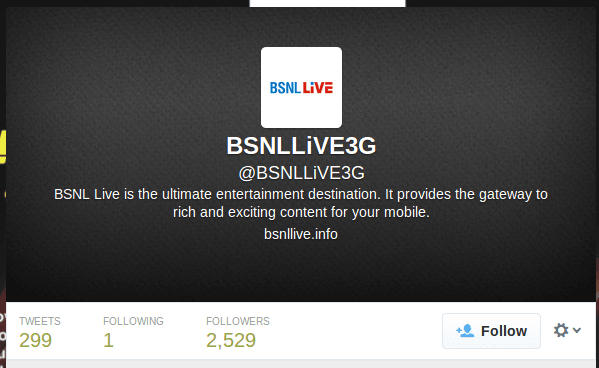 @BSNLiVE3G has 2.5k followers with 299 tweets. @bsnlmobileindia has 1000+ followers with just 23 tweets! Again both these handles are not interactive. Only one way tweeting! I have got some of issues resolved through BSNL Karnataka and they are doing a wonderful job. They even respond after office hours and on holidays! @BSNLKERALA which was active in the initial days was offline for over a month’s period. Did this happen because a single person who handled the account went on leave? We don’t know! The account is active as of now. Ultimately all this will cause BSNL to draw a conclusion that social experiments were a big fail after investing huge amounts of time and money! 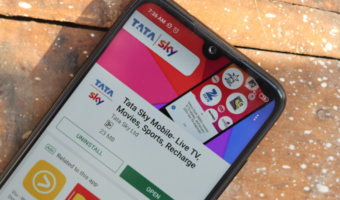 BSNL according to us must make honest efforts to observe private players like Airtel, Vodafone, Tata Docomo who provide reasonable quality of support to customers. BSNL can’t afford to waste time here thinking of way ahead. Instead of building new identities from scratch, old accounts could have been revived. If all you need is a new name, twitter allows you to rename accounts. This move could have brought in over a thousand followers at one go. 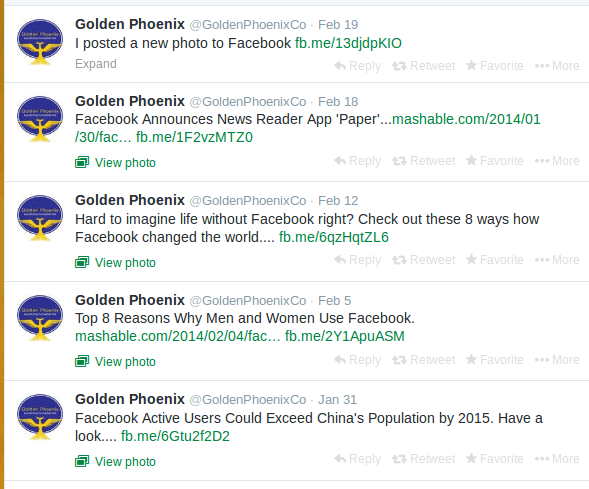 Given the facts about Golden Phoenix highlighted above, they seem to have questionable expertise in building a brand’s social media presence. A larger and professional agency should have been hired. Corporate website and several circle websites do not have a twitter logo linking to their twitter presence. This makes it incredibly hard for anyone to find their twitter identity naturally leading to little or no interactions. This must change and all websites must have the right links prominently displayed. BSNL could easily send out emails and SMS to let customers know about twitter presence apart from putting up links on own websites. It all boils down to experience and strategy when it comes to marketing a big brand. Let’s keep the facebook presence analysis for another day! 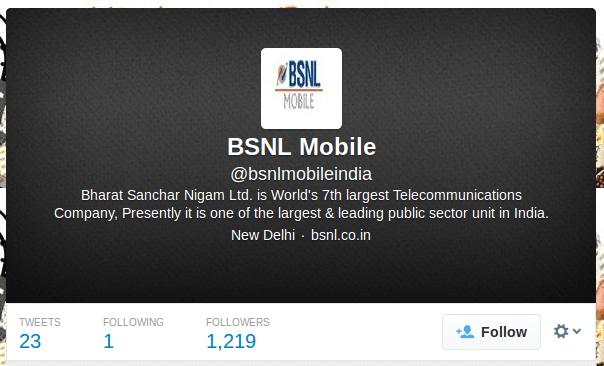 Were you aware of BSNL’s twitter presence? Did you approach BSNL through twitter and get your problem solved? How does it compare to that of private operators? For online recharge kindly use bsnl site ” portal.bsnl.in/”. Do not recharge with any other Internet sites. I am sure online recharge complaints will be sort out. I have tried this and its amazing. Earlier I used other private service providers but atlast I found BSNL is better than all other and hence I switched again to it. Please don’t recharge from Airtel website. As most of the tariffs has been changed and is still not updated on it’s website. lots of complaints already flows on airtel facebook page. Even local local vendors also don’t get updated. i.e., web exclusive recharge from airtel shows 300MB 3G data on Rs. 102/- whereas this facility is actually available now on Rs. 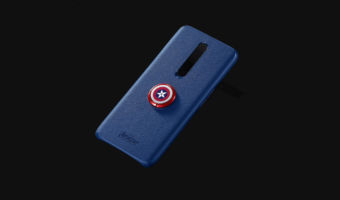 101/-. There are also many blunder mistakes on their regular tariffs. Please consult Customer care before recharging.